This poster is hanging in my office. 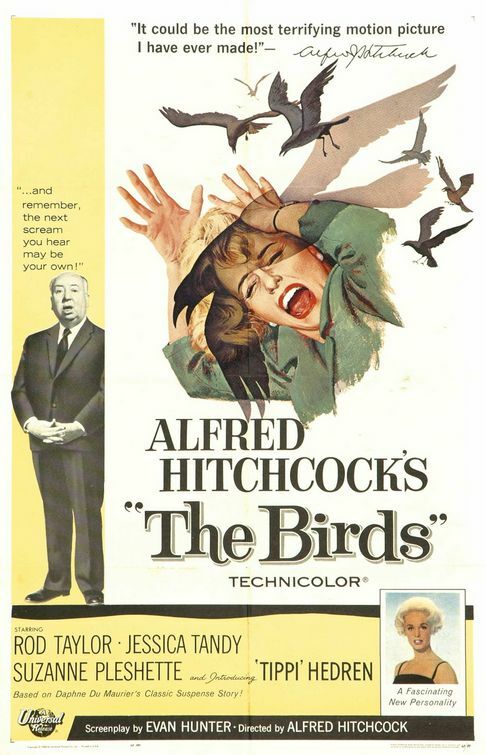 I’m old enough to remember when The Birds was first released in theatres, but as far as my mother was concerned, I was too young to see it. When I was a kid, our family went to the movies almost every week. This was back in the day when the production code was still in effect and movies weren’t rated. The Birds just wasn’t typical family fare in 1963. As I got older and interested in movies, I saw The Birds on TV, in the days when movies were regularly shown on the major networks. Like many, I found it fascinating and marveled at the—for the time—amazing special effects. When Turner Classic Movies announced that it would be shown on the big screen for one night only, in celebration of Universal Studios’ 100th anniversary, I jumped at the chance to see it. I was not disappointed. The new digital version looked brand new. The sound, which was such an important part of the film, was amazingly crisp and clear. One of Alfred Hitchcock’s biggest commercial successes, The Birds is far from the Master’s best. But as pure popcorn eating entertainment, it is enormously suspenseful and fun. The audience at the screening seemed to enjoy the movie. Many, I suspect, based on their ages, were first-time viewers. This matte shot of Bodega Bay in flames is still amazing to me. Like most Hitchcock film’s, it holds up well. I thought the special effects would look cheap and hokey by today’s CGI standards, but to my surprise they looked pretty good. The matte photography showing Bodega Bay in flames from a bird’s eye view is still impressive. Another thing that makes The Birds seem fresh is the polish Hitchcock and costume designer, Edith Head brought to the film. The cast is dressed classically. The green suit that Tipi Hedren wears—not to mention that mink coat—through most of the film has a contemporary and timeless look. The same goes for Rod Taylor’s suits and the casual clothes he wears on the family farm. they know how to dress! Some viewers find Hendren’s performance lacking, but I’m amazed at how effective she is as Melanie Daniels, the film’s heroine. She possesses all the Hitchcock attributes. She’s blond and beautiful, but she also holds her own opposite seasoned pros Taylor, Jessica Tandy, and Suzanne Pleshette. Considering she had no prior acting experience, I have to hand it to her because a big part of the film’s success rested on her shoulders. When the movie was first released, the ending was jarring and left viewers with questions. The same was true with this special screening. You could hear some folks mumbling “that’s it?” as the film faded to black. But that’s Hitchcock. He always leaves you wanting more. Hitchcock does always leave you wanting more. I like that he doesn't tie up the ending in a nice red bow. Great review! I'm not sure I could bring myself to see The Birds on the big screen - I can barely handle it on television! Thanks for stopping by again. It was a lot of fun seeing the movie on the big screen. I think you'll get another chance to see "The Birds" if it tracks the way the other Fathom TCM events go. You can cover your eyes during the scary parts!